Rian Johnson’s excellent feature debut is a neo-noir set in an American high school. This intriguing thriller stars Joseph Gordon-Levitt as a student-turned-dogged investigator. Gordon-Levitt’s great performance is complemented by a strong supporting cast. 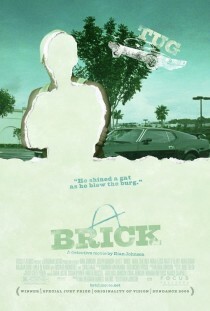 Brick is a unique film, created by a filmmaker who, on a tiny budget, is as resourceful as he is inventive. Highly recommended. Rian Johnson is a fantastic film maker – if anybody reading this review enjoys this film, his recent “The Brothers Bloom” is an equally sublime caper/romance/twist-filled yarn which is a joy from start to end. A delightful dessert when compared to the more substantive “Brick”, but none the worse for it.